This totally wacky post-apocalypse comedy lets the viewer know right away NOT to take it seriously, and it provides a lot of good-natured humour in what is basically a tale of war between the sexes. Feisty Amazonian babes rule the planet in the 31st century, keeping some men as slaves and others as “seeders”, or sperm donors. One of the men is Korvis (studly Chuck Wagner), who stumbles onto some pretty big discoveries when he finds an underground bunker. He encourages his male buddies, including Gruss (William Wallace) to think differently about the roles played by men and women. He also finds out how much fun it is to play prez-ee-dent. The nutty dialogue is often hysterical; after a while you do pick up what certain words and phrases mean. This dialogue is delivered with the utmost sincerity by a great looking cast of guys and gals. The movie was filmed on location in Israel by those always reliable folk at the Cannon Group. It does lose its momentum, but regains it for an action packed finale. The actors and actresses are dressed sexily but never reveal anything, nor is the violence ever overly bloody. (This *is* rated PG-13.) Writer / director David Engelbach (who’d penned “Death Wish II” a few years previous) is having fun here, and that feeling is infectious. Some of the biggest laughs are delivered by a shaggy Bigfoot like character named Aargh the Awful (played by Steve Malovic); the final freeze frame involves Aargh and it’s a howler. The audience may find themselves in tears, or rolling their eyes, at the abundance of silliness here. It’s very much the kind of thing you’d watch with beers and friends. It’s also well worth watching for any Laurene Landon fan, as she looks absolutely fantastic as always. Also supplying eye candy are Galyn Gorg (“RoboCop 2”) as Lynka and Camilla Sparv (“Downhill Racer”) as Reya. Shaike Ophir is endearing as put upon character Lelz. 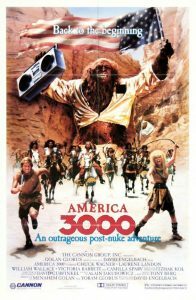 Accompanied by a quite appropriate cheese ball rock music score by Tony Berg, and effectively lit and photographed by David Gurfinkel, “America 3000” is overall just too hard to resist. It may not be “quality” stuff, but it sure as hell is entertaining.